Location: the summit of K2!! This is a blog post I’ve been wanting to write for 10 years. I’m not sure that words will ever do justice to the incredible experience that I had on the 21st July 2018 – a day that will be implanted in my memory with as much clarity as the 4th June 2005 (Everest), 13th April 2013 (my wedding day) and 15th August 2014 and 4th November 2016 (the births of my 2 daughters). The reference to both our wedding and the births of our children is important, as Saskia, Ottalie and Poppy were at the forefront of my mind all the way to the top. Of course I can’t just jump straight to the end – I’m going to have to eek out this tale a bit, so please allow me to indulge myself a little in build up. We’d had a rest day in C3 (7350m) on the 19th July. 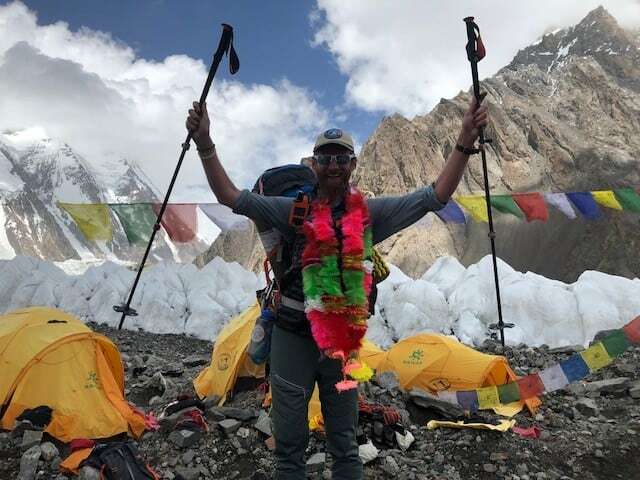 We’d been joined by the rest of the ‘Seven Summits’ team, which consisted of around 20-25 people (10 members and over 10 Sherpas and Pakistani High Altitude Porters). I was pleased that we were joining up with this group, as of all the teams on the mountain, they were the ones that we had got to know the best. 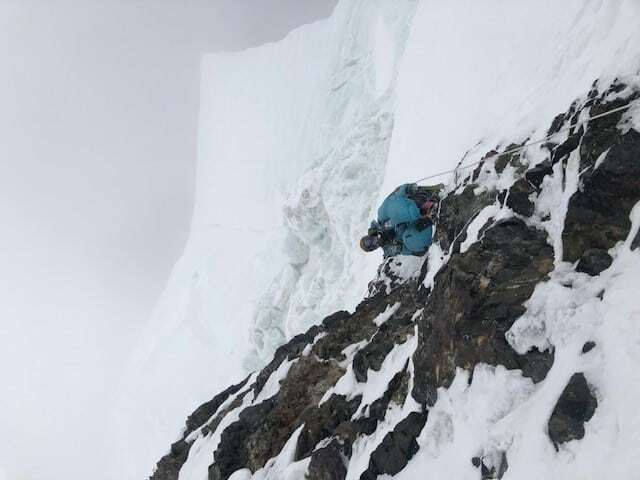 At around lunchtime there had been some consternation on the radios as there were reports that the weather was changing and as a result Dawa Sherpa (the Seven Summits Leader) was pulling his team back down. 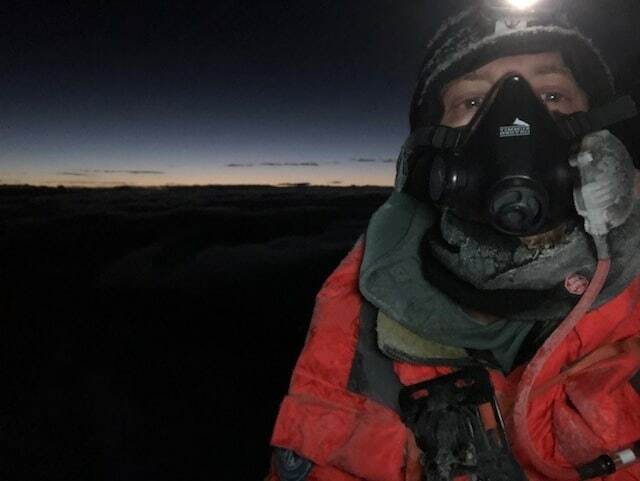 This appears to have been started by reports from Madison Mountaineering (the other biggest team on the mountain), who were only a day behind us were also abandoning their attempt. Tomaz and I were surprised by all this excitement, but still trusted in our weather report, and certainly after all the hard work in getting to C3, were in no mind to head all the way back down, to then wait for a better weather forecast and come all the way back up. Some of the team members on the other teams seemed in open revolt, whereas others seemed more resigned to the decisions being made in BC. Upon consulting with our own Sherpas, they certainly agreed with our point of view, and had no intention of heading back down, regardless of the outcomes of the other teams. 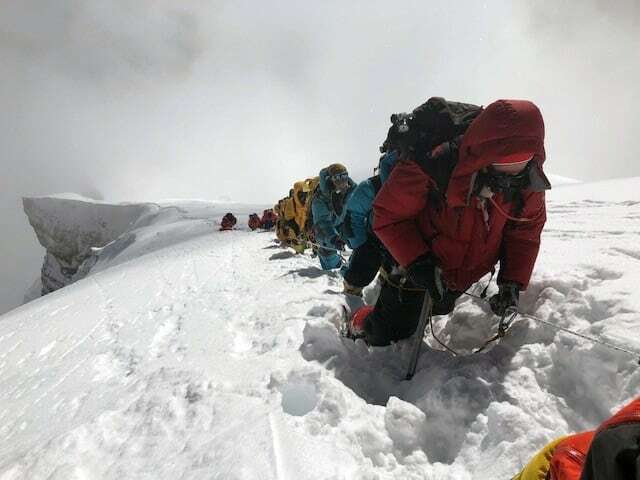 In the end, it appears that it was the steadfastness of the Seven Summits Sherpas who appeared to enable their team to remain up the mountain – they were obviously keen to continue and trusted that the weather would hold. We spent the rest of the day relaxing in our tent, drinking and trying to eat (I must admit that I’d lost all appetite and the thought of anything substantial made my stomach turn!). I didn’t have a particularly good night, very vivid (but mind-numbingly dull) dreams, punctuated by bad headaches. We’d decided not to sleep on oxygen, although many others would sleep on oxygen at this altitude. In retrospect, perhaps the oxygen would have helped us sleep better – this was certainly the highest that I’ve slept without using oxygen. The following day (20th July) we headed up to C4. Traditionally C4 is located either on, or just below the shoulder, a relatively flat (when viewed from basecamp) expanse which starts at around 7950m and leads up to the bottle neck at around 8300m. We were therefore expecting a 600m ascent from C3 to C4, and were somewhat surprised when we ‘arrived’ at a small camp of 2 tents dug into the deep snow after only 2.5 hours of climbing. 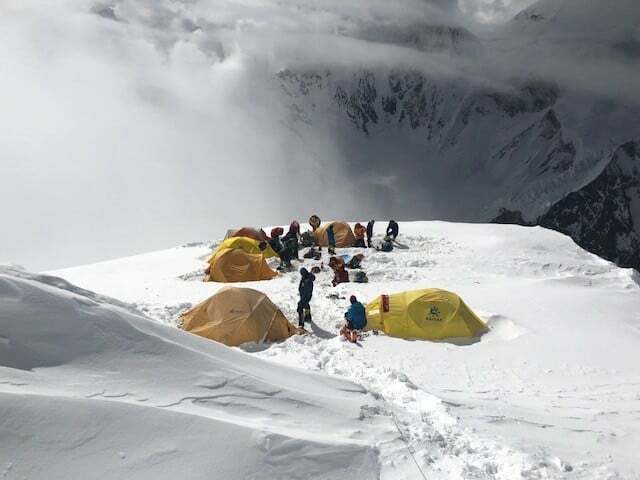 This ‘camp’ was located at 7611m, which was exactly 1000m from the summit. To be honest, we were quite surprised when we got to this location a perhaps it was an intermediate camp for the fixing team. Although I was certainly thankful for an opportunity to sit down and rest, I was also very aware that the lower our camp 4, the longer our summit day would be. Whilst a 1000m (or more) summit day on other mountains is extremely common, generally at this altitude, the summit day vertical gain is less, as its exponentially harder work the higher you are. As a comparison, in the North Side of Everest, the vertical summit day gain is ‘only’ around 550m from the top camp at 8300m. The Sherpas had a bit of a mother’s meeting, and they confirmed that this would be our C4. That settled the confusion (although a number of us were still concerned about the distance from the summit), and with tents erected, we settled into an afternoon of rest and relaxation. We’d have to make the most of it, as we’d be leaving for the summit at 2200 that evening. My appetite hadn’t returned, and whilst Tomaz wolfed down a packed of freeze dried chilli mac and beef, I just about managed a small packet of olives and 3 biscuits. I also didn’t fair too well on the rehydration, only managing a few cups of warm juice. I must admit that there is always something rather disconcerting about using water made from melted snow water, as whilst you’d think that it would be wonderfully pure, there is always all sorts of unmentionables floating around in the meltwater – from small bits of rock, to fibres and hair to little globules of I don’t know what. Call me fussy, but it really rather puts you off your drinks. I spent my awake time doing some sudoku puzzles in a book that is brought up. I kept telling myself that if I completed the one that I was on, the my summit would be guaranteed – and then massively piling in as I once again found I had two 7s in the same box. Perhaps it was the altitude, or perhaps the puzzle was flawed, but my silly superstitious behaviour didn’t seem to be working in my favour. We’d agreed with our Sherpas that we’d have some tea at 2100, so that we could leave at 2200. With Tomaz snoring soundly next to me, I dozed as it got dark. I was acutely aware of a lot of movement as a number of people were obviously leaving camp at around 2100, but was too lazy to really investigate. Oh well, the more people who are in front of us, the better the trail breaking will be through the deep snow, especially up to and across the shoulder. In the end, by the time we’d had our tea (which annoyingly the Sherpas had made with salt rather than sugar, leaving me feeling like I’d been gargling sea water), and we’d sorted ourselves out, we were stepping out of camp at 2230. This was a little behind schedule, but despite the minimal calories I’d managed to eat over the last 48-72 hours, I was pumped and excited, and feeling strong as a result. The first few hours flew by, and we’d made it to the start of the bottleneck within 2.5 hours (which to ascend 600m at this altitude was no mean feat). We even caught up with some of the cheeky early leavers, and managed to over take them. It was a beautiful clear night, and even with the glare of our headlamps on the snow, we could clearly see many of the major constellations. What was slightly more ominous was the shadowy bulk of the summit pyramid looming above us. The bottleneck is by far the most infamous section of climbing on K2. It’s not specifically they steepness (although it is pretty damn steep), but the fact that lurking directly above it is the overhanging snout of a huge glacier, which looks like it could come crashing down on you at the slightest notice. In any other circumstance, no one would climb anywhere near a feature like this. (In)famously, the collapse of a section of this glacier above the bottleneck contributed to a number of deaths during the 2008 season. 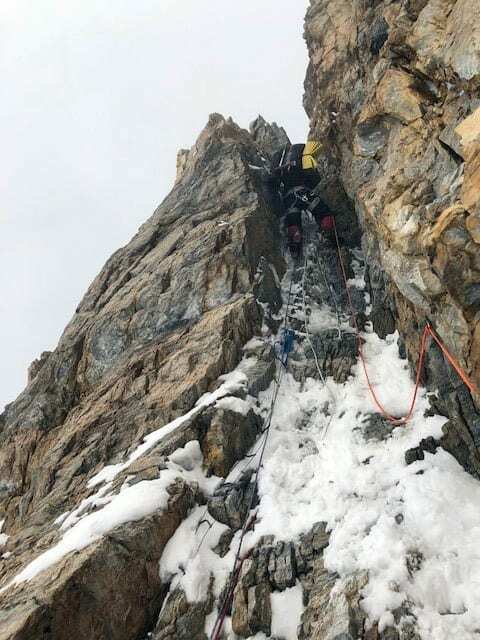 Unfortunately for K2 climbers (on this side of the mountain), it is pretty much the only way of getting off the shoulder onto the summit ridge (the only other option, the Wiessner Direct, a rock climb to the left of the bottleneck which avoids this, has been unrepeated since its incredible first (and only) ascent in 1939). We ended up climbing mainly on the mixed rock and ice ground slightly on the right side of the main bottleneck. Whilst notorious and incredibly steep, the bottleneck didn’t prove as much of a challenge as I was expecting – perhaps it’s the beauty of climbing at night by torchlight, you concentrate purely on what’s right in front of you and lose sight of your surroundings. Once at the top of the bottleneck, you then get onto the ‘Traverse’ which takes you left out from underneath the hanging serac. Again, this was certainly an interesting section of climbing, a very narrow (at times only 6inches wide) ‘path’ which traverses across the steep ground under the ice. The lead climbers (including our very own Jangbu) had fixed a rope here, attached to the ice at waist height with ice screws and the occasional icebar (an aluminium picket around 2ft long). I thought that once through the bottleneck and across the traverse, then the bulk of the difficult climbing would be finished, at it would then be just a simple snow climb to summit. How wrong I would be. Out from the traverse, we then encountered an incredibly steep ice wall. It wasn’t just the steepness (which averaged probably around 75 degrees), but it was the unrelenting nature of it. For most of the climbing, you were right on the front points of your crampons, which is agonisingly painful for extended periods of time. Even though there was the comfort of a fixed line for security, a number of the climbers above were either completely unused to any sort of ‘ice climbing’ techniques (such as dropping your heels) or utterly exhausted and struggled maintaining their technique. This made for much scratching and scrabbling around and a number of unnerving slips down the ice. The climbers above us were also going agonisingly slowly, but of course there was no way to pass them as it was too steep. In some circumstances, it was easier to wait and let them extend their lead, as it then meant that at least when you got to go for it, you could climb to a suitable rest point. Eventually we all managed to get through this ice cliff and onto slightly easier ground (I was then able to get in front of the two worst offenders). Many of the of climbers used this opportunity to change oxygen cylinders, although they must have had theirs on quite a high flow rate (Tomaz and I had our on 1 litre a minute for the entire summit day, which means that we only used one bottle each). From this point there was a long and narrow summit ridge, which averaged around 40-50 degrees – steep enough, but much easier on the calves and the nerves that the previous ice cliffs. I could see around 100m above me there was a largish group of around 12 people stopped on the ridge. They weren’t moving, but as I got closer to them I realised that they were waiting for the lead climbers to finish fixing the rope to the summit. In the end , we were waiting here for around 30 minutes, fortunately it wasn’t too cold, and most of us perched on the steep snow slope to allow some respite for our legs. Finally it was confirmed that the summit rope was secure and we started our slow march up to the top. The ridge was narrow, and there was now place to overtake, so it really was a sense of ‘take your place in the queue’, but this didn’t diminish from the sense of excitement as we neared the true summit. Once off the steep narrow ridge we entered into the true summit plateau. From memory it was larger than Everest’s, but there was a clear top, with the ground sloping rapidly away to the north (and dropping near vertically to the south. And then we were there. 0800 on the 21st July 2018. It the funny thing about climbing very big mountains – people often ask what there is at the top – to paraphrase Ed Hillary, ‘we kept going, and then there was nothing’. No marker post, no USGS trig point, certainly no summit cafe! The object of your desire is marked by nothing more than the vanishing point of white to blue. Despite the fact that there were about 30 of us summiting within a 5-10 minute period, it didn’t diminish from the experience. 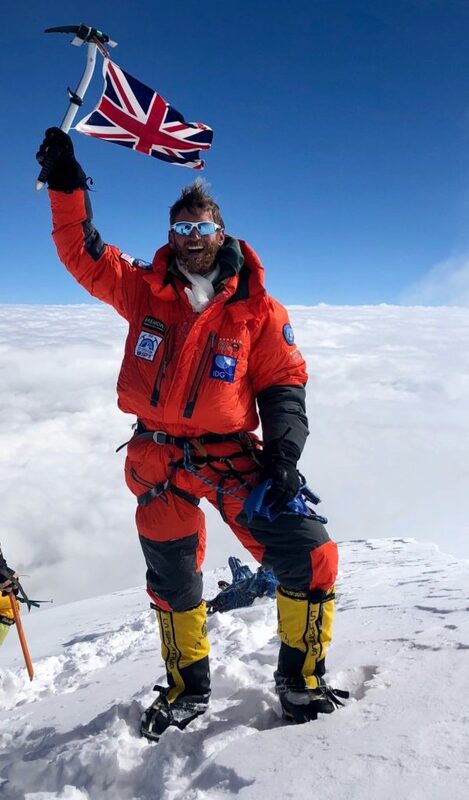 In fact I think it actually added to it – I knew all the climbing members, and recognised most of the Sherpas from the other team, and as such, there was a tremendous sense of mutual achievement – everyone hugging each other, high-fiving, fist bumping, each celebrating in their own particular way. Of course trying to hug in a puffy down suit wearing the oxygen mask is as impersonal as trying to do a waltz in a suit of armour, but the sentiment was there. After a few minutes of celebrating, I realised that I had a lot of sponsorship commitments to make, so out came all the banners, as well as the all important Union Flag on the ice axe shot. I took a few photos for my Army Reserve Regiment, including wearing my beret (probably the only time I’m going to be able to get away with wearing a beret with reflective sunglasses and a huge Thor-like beard (although that does describe most of the Danish Special Forces we worked with in Afghanistan!). I mixed a Gin and Tonic (Fever-Tree of course), which must be an altitude record for a land-based drink, and shared it around – delicious, but extremely cold! The weather was generally pretty clear – slightly gusty, with a cloud lying over much of China at about 6000m, whereas looking over the Pakistan side, it was clearer. The wind was whipping up a certain amount of swirling spindrift, which also contributed to it being a little hazy on top. Soon I looked at my watch, and we’d been on the summit for 45 minutes, and it was time to start our descent. Tomaz and Ang Pasang had already started their descent, so Gelgi, Jangbu and I started our way down. Whilst going up can be physically demanding, often the descent can feel worse. Of course you do come down much quicker, but things seem to take much more time and effort, and you realise that you’ve come a lot further than you think. By this point, the cloud had also closed in around us, reducing visibility significantly. Down the long summit ridge, down the steep ice faces (scratching around on them, appreciating that they really had been as steep as we’d remembered). Tentatively across the traverse before abseiling down the bottleneck. Whilst on the bottleneck I cut a section of old rope out and pocketed it. I’m not quite sure what I’m going to do with it, but quite a nice keepsake (and certainly no risk of being blamed for ‘stealing’, when I’m actually helping to remove rubbish on the mountain). Climbing down and across the shoulder seemed to go on for ever, and I had to stop every 50-100 steps to rest my weary legs. By about 1100 we’d made it in to C4, where we had a wick drink and them packed up anything we’d left there (such as sleeping bags and none essential summit kit). Whilst it’s exhausting, and frankly you’d sleep just about anywhere, I think it’s always best to get as far down a mountain as possible immediately following your summit attempt. Part of me wondered whether getting all the way back down to BC might be possible, but realising how exhausted I was, I soon dismissed this idea. BC could wait to the morning. As a team we agreed to get down to Lower Camp 2 (underneath House’s Chimney), where we’d stayed on Tuesday evening. This we did, and with a storm now raging outside, Tomaz and I snuggled into our tent (of which the outer had been ripped by ice and rock fall from the Chimney). Neither of us were particularly interested in eating anything, we just had a bit of hot drink before getting into our sleeping bags, and soon we were dead to the world. I think that must have been my best nights sleep on the mountain thus far – pretty much 10 hours straight. The only thing that woke me up was a full bladder (to be fair, I can’t remember going to the loo for at least the previous 24 hours). God bless the pee bottle! Once awake, it was just a case of get up, pack bags and go. I left the tent at about 0615, and by 0830, I’d arrived at ABC. I must admit that abseiling around 1200m when you’ve hardly eaten anything for 72 hours wasn’t exactly pretty, and I did skip and slide all over the place, but I did consciously choose every rope, and back up every abseil. In ABC I changed out of my big boots, back into my trainers, and took off my harness, helmet and outer wear. Whilst my rucksack was now weighing around 35kg, I was feeling lighter in myself and I soon started my slow and weary trek back to BC. The route through the icefall had changed once again, and not necessarily for the better. I’d caught up with a group of 3 Sherpas from the Seven Summits Group who were also picking their way through the icefall, and at least I knew that their packs weighed about the same as mine, and therefore whatever trail they picked should be good enough for me. Suddenly I came round a corner in the icefall to see Zulphi (our cook) and Porman, one of our kitchen boys. They’d brought drinks (including a bottle of coke), boiled eggs, boiled potatoes and biscuits. It was like manna from Heaven! Sitting on the ice of the glacier, nothing has every tasted quite so good. Porman continued up to ABC to wait for Tomaz and the Sherpas, whilst Zulphi kindly (but somewhat foolishly) offered to carry my backpack down to BC. We stopped off with some of the other teams in BC (inevitably everyone offers you a drink or something to eat), and I was so parched that I couldn’t refuse. We eventually got back into our own BC at around 1200, to be treated like the returning conquering hero by the three other Sherpas and the kitchen staff. It was an amazing feeling – it may not be home, but it feels like a home from home, and it feels like true success. Tomaz and the Sherpas got down several hours later, each of them looking more and more relieved as they entered BC and were able to shrug off their heavy rucksacks. Whilst it’s certainly not over (we still have a very long walk to get back to civilisation! ), it feels like mission success. I’d like to take this opportunity to thank everyone who’s followed this trip, whether through social media or the blogs and website for all your interest, love and support. I am always acutely aware on big trips like this, that there are so many people who are glued to the trials and tribulations – many who I don’t personally know, or who I’ve never met, and it brings me great joy (and a sense of responsibility) that you’ve followed my journey. A massive thank you to my sponsors, including IDG, Bremont and the several very special others who’ve financially contributed to make this adventure possible. I’ve had lots of support from brands and businesses who’ve supplied free product (normally edible or wearable), so thank you! I am delighted to once again be raising money for Walking With The Wounded – an amazing charity, which is very close to my heart – I know that many of your have already been generous in your contributions, and thank you for your support. Recognising that others might benefit as a result of my own ridiculous adventures is a massive motivation. Thank you of course to Pip and Matt for your support for the social media and website – everything you’ve seen or read about the expedition is ultimately down to them. Finally, and most importantly, thank you to my wife Saskia. As always she has been my rock, and to be honest I don’t know how she can actively support her husband to do something like this (and this isn’t there first!). Whilst I’ve been away on my extended summer holiday she’s kept 2 under 4a alive, moved house (into an incomplete project…) and managed the biggest event of her profession career. She’s done all of this without complaining – and if you think that what I do is impressive, it isn’t a patch on how she approaches the world. Every single day. Thank you my love. Whilst I don’t intend for this to be the last blog of this trip, I do recognise that it’s the most important. 10 years. 3 attempts. Nearly 6 months of my life away from home living in a tent on the Baltoro Glacier. Countless thousands of metres ascended and descended. 3 different teams. A lot of money from many different sponsors over the years. This mountain and this dream has required more of me than almost anything else in my life. It has haunted my dreams, it has distracted me from many much more ‘important’ things in life. It’s taken me away from my children (especially when they are too young to realise just what exactly I’m doing). However I can now say that it’s all been worth it. Like some ridiculous theme park ride – 2 hours of queuing for 2 minutes of thrill. Everything was worth it for those 45 minutes on the summit. Perseverance, tenacity, sheer bloody mindedness, whatever you want to call it. It defeated me twice, but I’m so pleased that I decided to come back again and again. 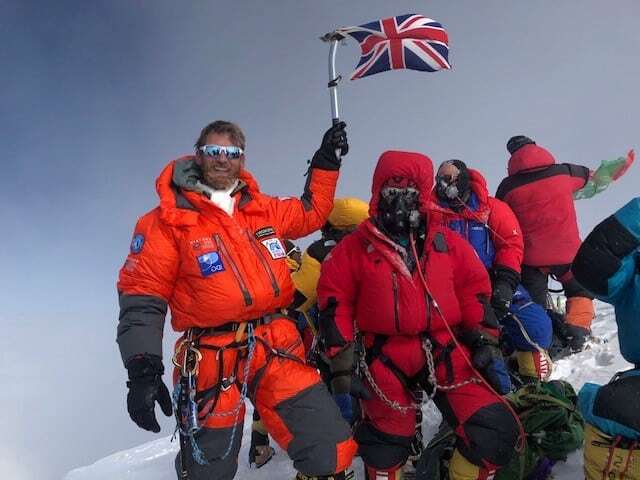 I am the 380(ish) person, and the 10th Brit to have climbed K2. I believe that I may also be the ‘youngest’ Brit as well, although at the grand old age of 34, perhaps ‘least old’ is a more fitting epitaph. None of these statistics matter – ultimately it’s been about following a dream, getting knocked back time after time, and yet coming back for more. That is true success. To paraphrase Churchill – ‘Success is not final, failure is not fatal. It is the courage to continue which counts’.